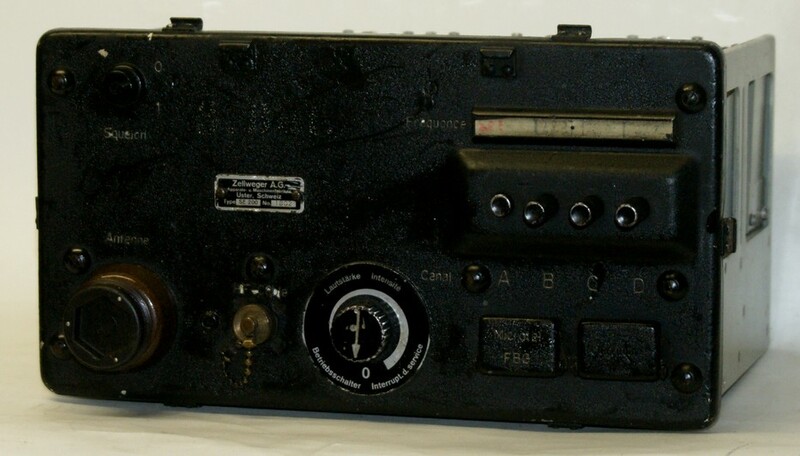 Zellweger AG, Uster, developed a portable transceiver with four crystal controlled channels and frequency modulation in the fifties, the set was introduced in 1957 with the infantry, around 1300 sets have been built. 22 - 32 MHz range, 101 channels. The wireless station SE-200 consists of the transceiver itself in a robust metal cabinet on a backback carrying frage with a weight of 18,0 kg and a hand cranked generator, which has a weight of another 17,6 kg. The set can be operated from batteries, it will need a 4,5 V LT / heaters battery (LSA 49122) and a 90 V HT / anode battery (LSA 49121) - or is can be powered from a hand cranked generator, the output power will be increaed from 0,8 to four Watts using the generator. The generaor can be used as a rotary converter operated from 6 V CD from a vehicle battery. The receiver is of a single conversion design, the antenna signal will pass two R.F. amplifier stages and then be mixed (1R5) with the fourth harmonic of the frequency channel quartz (in the range 4,745 - 7,245 MHz). The resulting intermediate frequency of 3,02 MHz will be amplified in three stages (1T4, 1T4, 1T4) and will be demodulated after having passed the limiter (1U4) and the diskriminator stage (1N34). The audio signal has to pass another two amplifier stages (1U4, 3S4) and will feed the headphones, a 1U4 valve is used for the squelch. In transmit mode, the audio signal from the microphone will pass an amplifier stage (3S4) and does modulate (1N34) an oscillator signal of 125,833 kHz (1T4), after a sixfold multiplication of the frequency (1U4), the signal of around 755 kHz will be preamplified (1U4), mixed with the oscillator signal from the transmitting frequency crystal (4,745 - 7,245 MHz)(1N34 x 2), has to pass two frequency doubler stages (3S4 and two 3S4) to reach the final R.F. amplifier in the transmitter stage (two 5618). The SE-200 is designed for very uncomplicated operation: next to the telescopic antenna socket and the external antenna jack, You find the main switch combined with the volume control. The frequency is selected by pressing one of four frequency channel buttons. A "Lärmgarnitur", a combination of a set of headphones and a throat microphone to be used by the signals operator or a remote control set are plugged in the corresponding jacks - there has also been the possibility to plug in a "Microtel", a telephone like handset with a push-to.talk button intended to be used by officers to communicate with their superior. The four frequencies are controlled by plug in crystals. For each crystal controlled frequency, the set has to be pre-tuned: the chassis has to be taken out of the cabinet and a simple pre-tuning / alignment procedure has to be made by the radio operator. The channel numbers have to in ascending frequency order and had to be written on a paperboard strip after pre-tuning has been made. The operation frequency (MHz) is calculated from the channel number divided by 10. The set is equipped with a telescopic antenna, by use of a 15 m coaxial cable an a separate base, this can also be used as "long distance antenna" erected on a well suited hilltop, a tree or something similar. 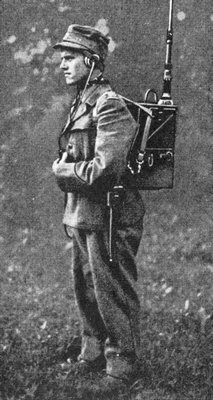 A "remote control set" allows the set to be operated from a field telephone line. 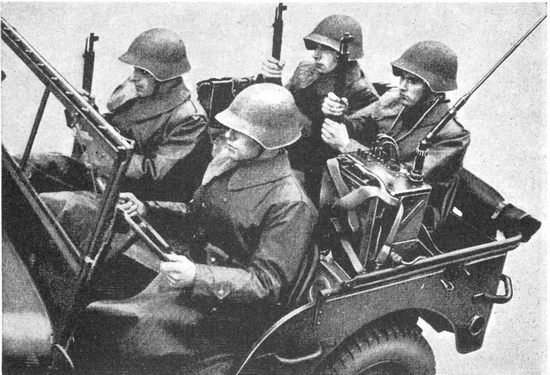 SE-200, backpack "Four in a Jeep"